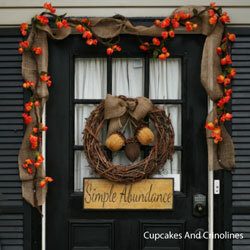 Autumn decorating ideas should not only be fun but also inexpensive as well. There are so many ways to us your existing decorative items and ingenuity to create a curb appealing front porch. 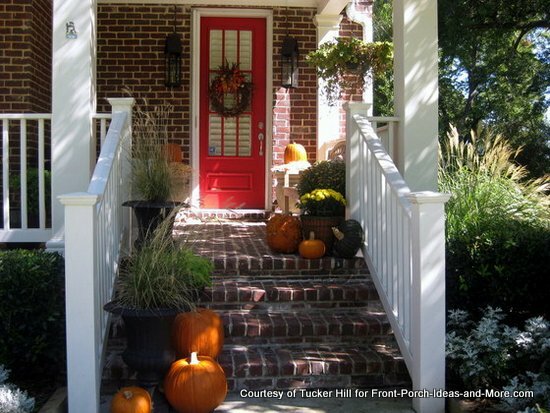 Whether creating front door wreaths for fall, making decorative pumpkins, or dressing up your porch furniture, our fall decorating ideas will help you create what Mary and I like to call "autumn front porch envy"! 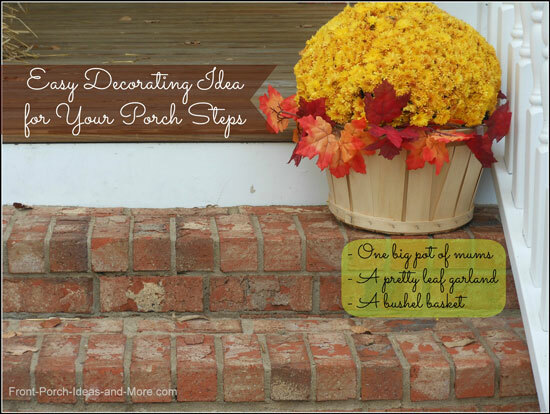 Easily decorate your porch steps for autumn with a bushel basket, a leaf garland and a big beautiful mum. How easy is that. And it looks spectacular on these porch steps. Frame your garden arbor with cornstalks and pumpkins. A pretty autumn scene - without a big investment or fussing. Just simple and beautiful! The summer flowers still add splashes of color. 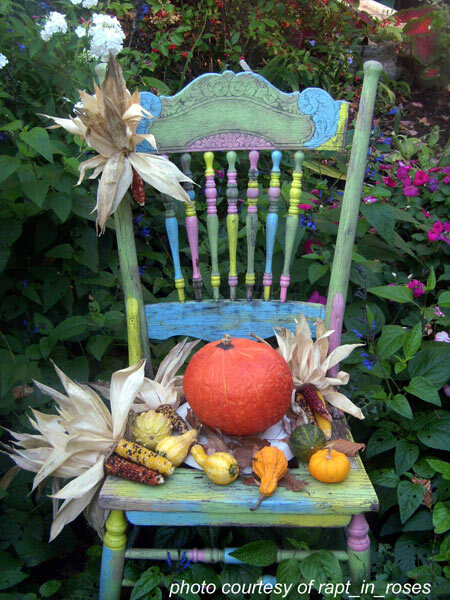 You can easily turn an old chair into a decorative fall piece with paint as depicted in the above photo. 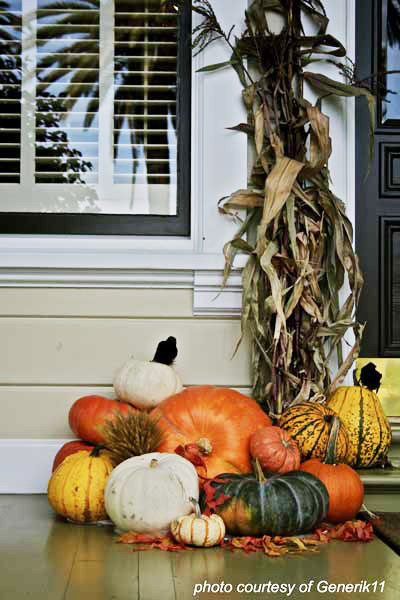 Add a few gourds, pumpkins, or corn to give it autumn appeal. It really makes for a nice conversation piece too. 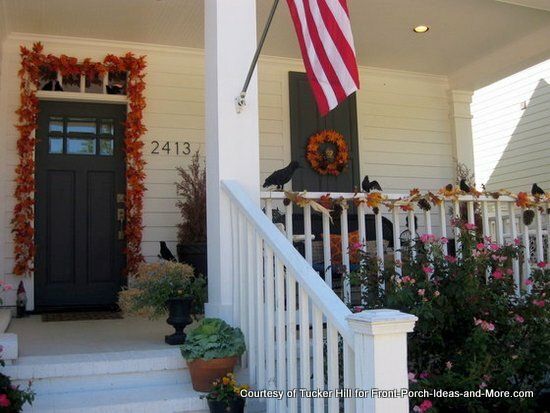 Speaking of using color, check out Tress's autumn decorated porch project below. 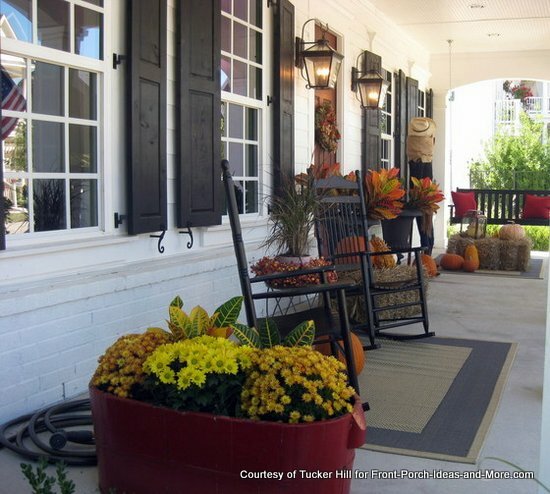 Tucker Hill is a community in McKinney TX, not far from Dallas. They are a porch loving community indeed. 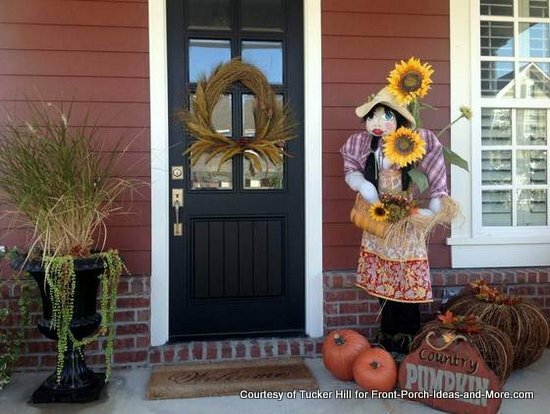 See how several of the residents decorated their porches for autumn. The rockers are the best. Pumpkins, bales of hay, lanterns , pretty plants and a comfortable rug, too. Leaf garland and crows. Simple and perfect for fall. 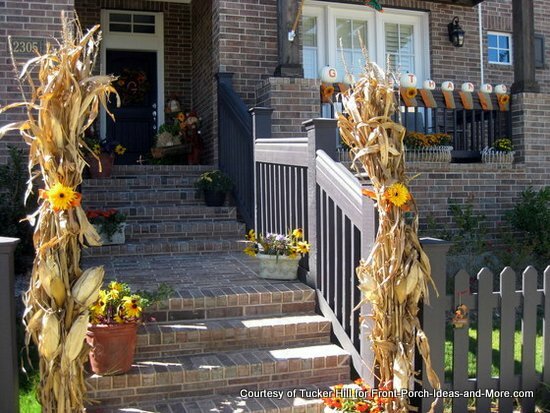 Corn stalks tied at the porch stair rails and then secured with a pretty sunflower. Simple autumn beauty. This fair lady greets guests with an armful of sunflowers. 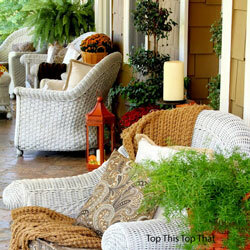 Here are a few more ideas you can easily use this year on your front porch. After seeing these ideas, enjoy our other autumn links below. Grab a cup of spiced cider and enjoy! Little details can make all the difference when decorating for fall. Notice the addition of leaves around the display in the above photo. Although subtle, the leaves add lots of appeal to an otherwise typical autumn decorations. Also note the color and variety of pumpkins and gourds which makes this an aesthetically pleasing arrangement. No matter your fall arrangement, there is usually something extra you can add that brings it all together. 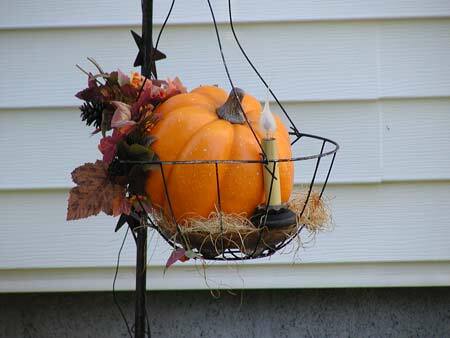 We have a myriad of fall photos throughout our autumn decorating section, so take note of the "extras" you might see. 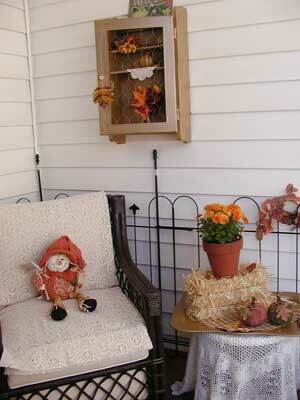 Autumn decorating on Deb's back porch is fresh with a vintage simplicity. 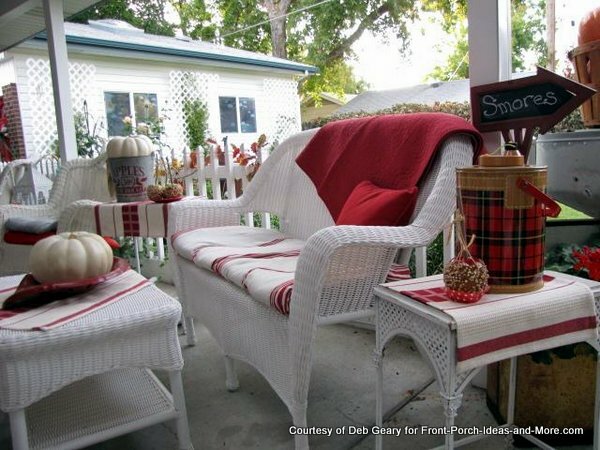 We love all the small touches: the crocks, thermos, red and white ticking fabric, candy apples and white pumpkins. Must be a delight to relax on their back porch. 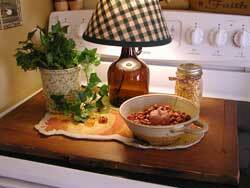 Deb tells us that she uses old tablecloths for her cushion covers. No sewing - she just safety pins them on the underside of the cushions and changes them out 5-6 times a year. You can easily arrange your existing plants like in the photo above to create a most curb appealing approach to your front porch. Intermingle gourds or pumpkins (remember the details we discussed above) to give it the autumn touch. Don't forget you can paint the pots in fall colors too, for even more appeal! Pumpkins corn stalks decorate front door to house. 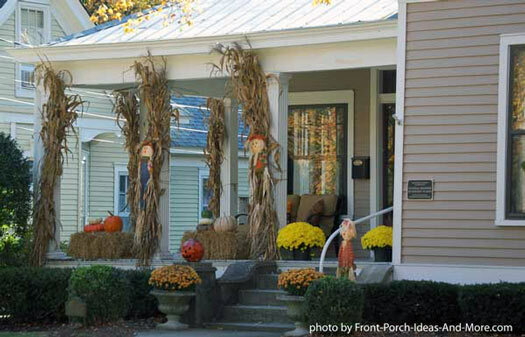 Nothing gets us in the spirit like pumpkins and cornstalks to decorate your front door and porch. Cornstalks are relatively inexpensive to purchase and pumpkins are usually fairly abundant in the fall. You don't have to encircle every porch column. 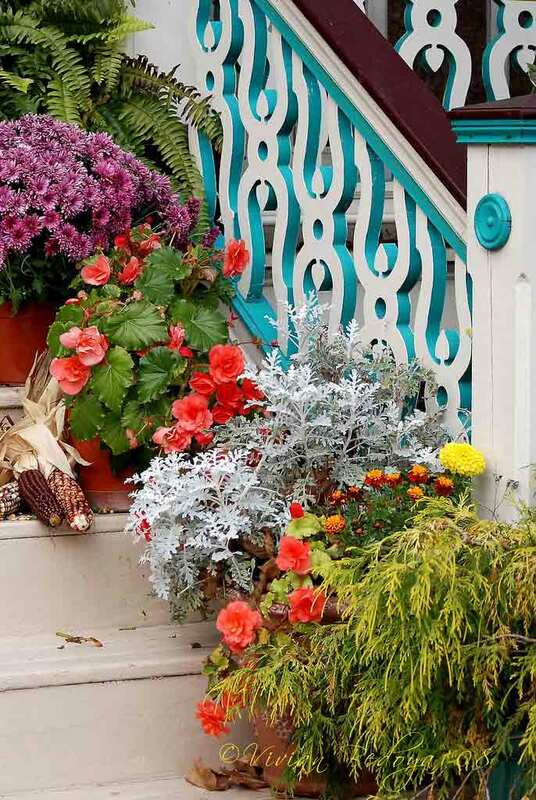 Experiment to see exactly what works best on your front porch. Often times, creating a display around just one column will work perfectly. Mary and I like the idea of investing in faux pumpkins as a cost savings method. Although initially more expensive, they will last for many years. Wished we would have remembered it this year. Ugh! You can paint or decorate them over and over as well. (Purchase them at the end of the season to save even more). 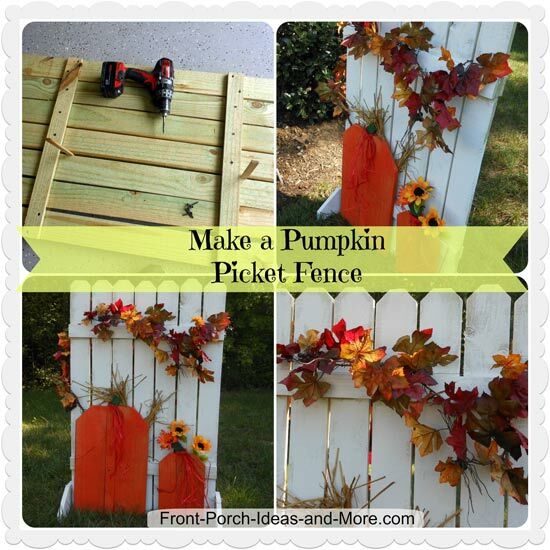 Make this fun pumpkin picket fence for your front porch or yard. It is easy to do and you can transition it for other holidays as well. 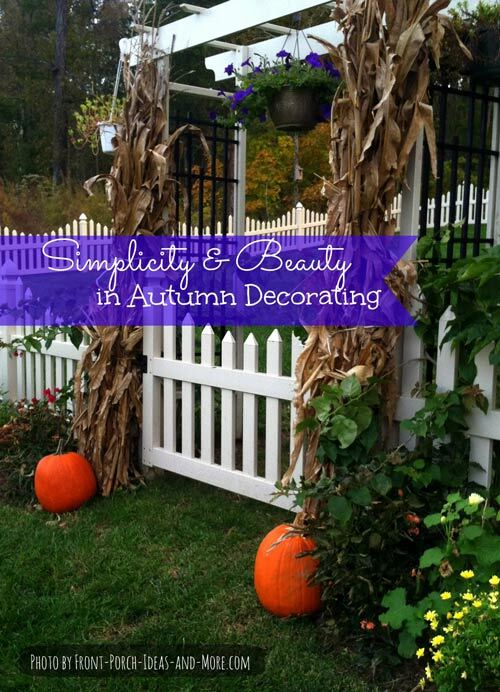 It's a perfect autumn decorating idea! Tress absolutely loves autumn. 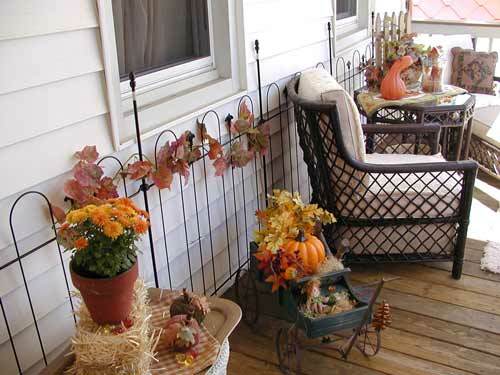 Her autumn decorating ideas will get you in the mood to decorate your own porch for the season. Learn more about Tress below. She loves decorating for fall and the beautiful autumn colors - especially "nutmeg colors infused with burgundy, primitive gold and brown". 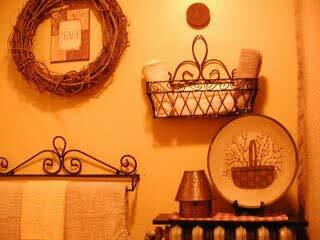 She incorporates these warm, rustic colors in the cozy Parsonage where she, her husband and their daughter live. In preparation for decorating for the fall, Tress shops at bargain discount places and yard sales for autumn decorating ideas. This year when she pulled out her bins of decorations, she also decided to paint! While she likes sage green, she was ready for a change. So Tress painted over the sage green walls in her home with beautiful shades of gold, tan and nutmegs. Tress and her husband love the results. She even carried these colors to her porch. 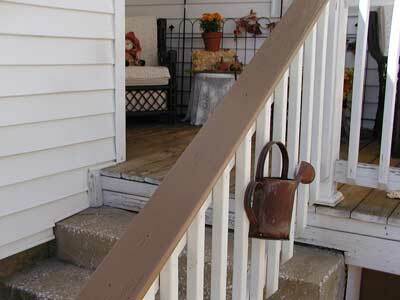 She painted the top part of her front porch railings and the railing leading up to her porch steps the warm nutmeg color. Enjoy these pictures of Tress' autumn-decorated porch all "done up in the autumn glow of toasty nutmegs and sugary maples". 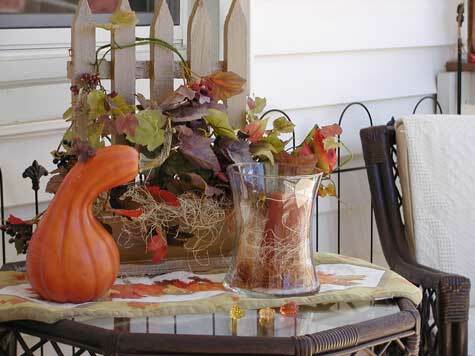 Here's a table on their porch that Tress dressed up for autumn with gourds, foliage, candles and a pretty linen. Do you have some autumn decorating ideas for fall to share with us? Replace [at] with @ please. Enjoy the rest of Tress' charming pictures. 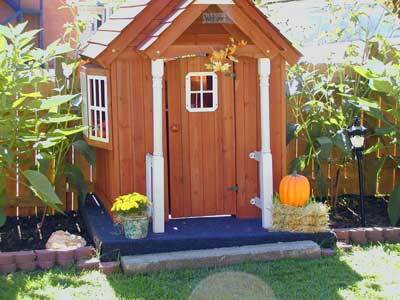 She even decorated the handsome shed in their back yard with pumpkins and mums. Tress is married to a Pastor and enjoys primitive, country decorating. She's a stay-at-home Mom and authors a beautiful blog, Warmth and Comfort in the Home. We thank Tress for inviting us to see the her wonderful autumn decorations. What an inviting porch and yard. Tress knows how to make a house a home!